You can make a wine cork corkboard from all of those corks you have laying around. The corkboards look very nice in your kitchen or den. Kids like them in their own rooms to decorate with what ever they want. The first thing you will need is a wooden frame. You can buy them at some of the wineries online or else you can make one yourself. You can also get them at craft stores. You can make the frame any size you want and out of any kind of wood. I make them out of pine and then stain them any color to fit my decor. You might be able to find some kind of frame at a thrift store. Anything will work as long as it has a backing board. I have seen them made out of a serving tray and they really look nice. Craft stores have frame boxes that you could use for your wine cork corkboard. All you need to do is glue your corks into it in a crosshatch pattern as shown in this picture. You can use all the corks from a single vineyard, or else you can mix up the wine corks from many different wineries. Just remember that some corks will be a different size. You can make any design that you want with the corks. You can make them go all one direction or cross hatch some corks and make the others straight. I added some grape leaves on the side of the corkboard. It does add a little bit of decoration and looks nice. You can use hot glue to glue them into place but I prefer to use a tacky glue. They seem to hold better. Just be sure to let it dry before you hang it up. You can also cut the corks in half before you glue them on but I like the looks of the whole cork. If you make a wooden frame be sure you put a backing on it. 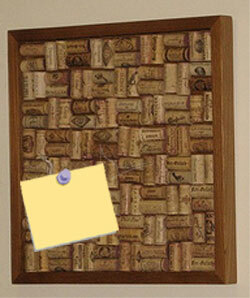 Then you can then glue corks onto it in a crosshatch pattern and have a fun corkboard! You can use all the corks from a single vineyard, or mix up the wines you've tried over the years. When you get all done you will have a wine cork corkboard that you can enjoy for many years.